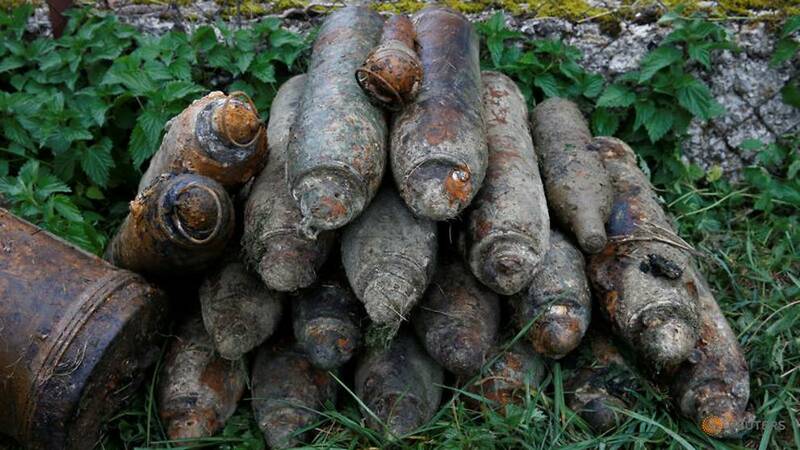 As the 100th anniversary of the end of World War One draws near next month, bomb disposal experts are still digging up munitions sunk in the killing fields of eastern France - and it could be another 100 years before they are done. In Vilosnes-Haraumont, where the River Meuse snakes north and west from Verdun, the German army dumped thousands of artillery shells into the river's slowly shifting waters after the battle of Mort Homme in 1916. 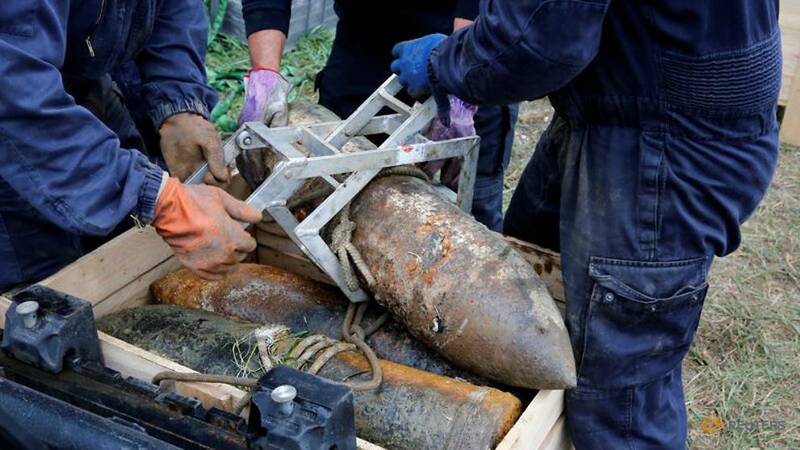 Last week a pair of scuba divers plunged into the chilly waters to tie ropes around dozens of shells buried in the river bed, before a crane dragged and carefully lifted a string of the rusted ordnance onto the grassy bank. In one day's work, more than five tonnes of unexploded shells were dredged from the river, an unusually large haul. 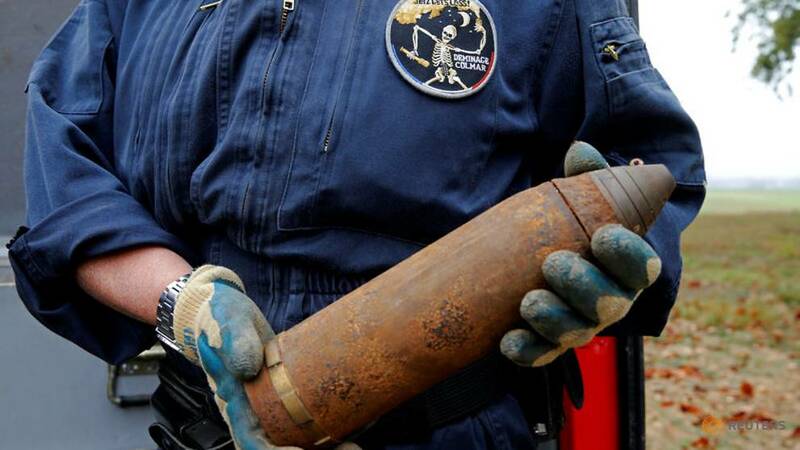 In a normal year, the Metz Demining Centre says it collects between 45 and 50 tonnes of ordnance, and it estimates there are at least 250 to 300 tonnes still buried in the nearby rivers and rolling hills of eastern France. For Guy Momper, the bomb clearance specialist overseeing the clear-up, it is a painstaking but essential task to protect people from ammunition that could still explode and return the French landscape to the way it was before the war. "We need to tidy up the land," said Momper, who estimates it could take more than a century to clear all the munitions. "As a matter of principle, from the moment a shell is reported, we go out and collect it." World War One was largely fought on French and Belgian soil. The bulk of the grinding conflict took place in trenches - sometimes only a few metres apart - dug into the soil along the borders of France, Germany and Belgium. More than 10 million soldiers, including 1.4 million French, died in the conflict, which came to an end on Nov. 11, 1918, dramatically altering France's demography and landscape. The physical impact can still be seen, with the traces of old trench networks scarring the fields, and the ground pockmarked by the blast holes from exploded shells. While the munitions pulled from the River Meuse have little risk of exploding, Momper and his team want to make sure there are no accidents. Alongside the river, they stack dozens of shells in neat rows, ready to be packed and removed. "There are regularly accidents involving people who fancy themselves as deminers but who go too far," said Benoit, a deminer working with the Metz team. "Unfortunately that costs lives in the worst cases."